Firefighting Blimp Drones to Put Out Wildfires | FuturePrize | What Does the World Need? Each year we spend billions of dollars fighting wildfires. They destroy millions of acres of forests, cause billions of dollars in property damage, and cost the lives of many firefighters and civilians. What if there was a much cheaper and more efficient way to extinguish these fires, and without putting anyone in harm's way? Perhaps an automated fleet of drone blimps could be used to dump water onto wildfires? A fleet of hundreds of hydrogen-filled mini-blimps could operate 24 hours a day, and could refill their water tanks at solar-powered refilling stations located on lakes, reservoirs, or other nearby water sources. These stations could also provide hydrogen from the electrolysis of water, as well as recharge drone batteries, meaning a very low operational cost. Because airships are slow moving, it should be possible for a very small number of operators to control a large swarm of drone blimps. It's likely that many of the major tasks like flying to fire zones, refilling tanks, refueling balloons, etc. could be completely automated, with the operator only specifying broader goals like where to dump water, and to intervene in the event that something goes wrong. With the availability of incredibly cheap components like computers such as the Rasberry Pi and Arduino, mobile devices and cameras, standardized drone parts, and lightweight plastics, it's likely that the total cost per blimp drone could be very low if mass produced. This would make individual balloons expendable, and should make cheap to produce hydrogen a viable option to fuel the blimps, even though it's more volitile than expensive and scarce helium. However, as a safety matter, it would be a good idea for the drones to have the ability to dump their water tanks immediately upon losing altitude, in order to prevent damage from a crash. Teams might consider using helium or fire retardant instead of hydrogen and water, if the economics or engineering work out differently than expected. 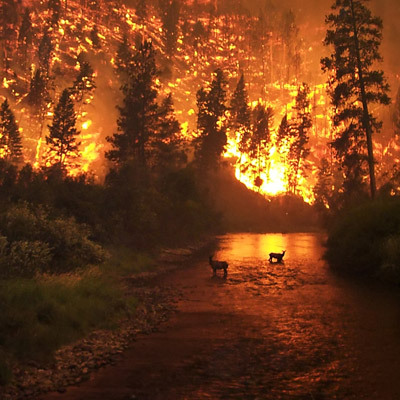 Note: Ecologists believe that some amount of wildfires have a beneficial effect on our ecosystem. If a drone blimp system proves effective, it could be used in conjunction with controlled burns, in order to precisely control what's cleared and prevent damage to property and danger to human lives. The winning team will demonstrate a mini-blimp drone system capable of fighting wildfires by carrying water or fire retardant and dumping it over wildfire regions, and then returning to a staging area to refill/refuel. The winning team's system will be as autonomous as possible. The winning team will detail how their system can scale up to the hundreds of blimp drones necessary to effectively combat a wildfire. The winning team will put forth detailed cost estimates that prove their implementation will make economic sense at scale. The winning team will demonstrate that their system has adequate safety precautions for those on the ground, such as a blimp immediately dumping their water if it begins to lose altitude.